An extreme gem: The third-hardest gem mineral. The gem with the finest "cat's-eye." 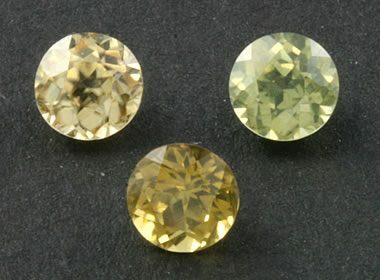 Chrysoberyl: Three faceted chrysoberyls showing a range of yellow and yellow-green color. These stones were produced in Sri Lanka and are about 4.3 millimeters in diameter and weigh about 0.52 carats each - a very high weight for stones of this size, caused by chrysoberyl's high specific gravity. Chrysoberyl is a beryllium-aluminum oxide mineral with a chemical composition of BeAl2O4. 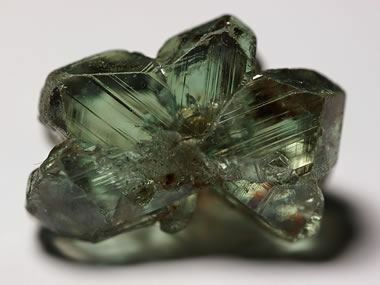 It is distinctly different from the beryllium-aluminum silicate (Be3Al2(SiO3)6 mineral known as "beryl," although the similar names can cause confusion. Chrysoberyl is not found in deposits that are large enough to allow it to be used as an ore of beryllium. Its only important use is as a gemstone; however, it excels in that use because of its very high hardness and its special properties of chatoyance and color change. Ordinary chrysoberyl is a yellow to yellow-green to green gemstone with a translucent to transparent diaphaneity. Transparent specimens are usually cut into faceted stones. Specimens that are translucent or with silk are usually cut into cabochons. A photo of ordinary chrysoberyl is shown at the top of this page. Cat's-Eye Chrysoberyl: Chrysoberyl that contains large numbers of fibrous inclusions can produce a "cat's-eye," a line of light across the surface of the stone that orients perpendicular to the included fibers. Chrysoberyl is the gem that exhibits the finest cat's-eyes, and when the term "cat's-eye" is used without a mineral name as a modifier, the speaker is most likely referring to chrysoberyl. This specimen exhibits the "milk-and-honey" effect - when properly oriented, the stone has two apparently different colors on each side of the cat's-eye line. This green cat's-eye chrysoberyl was produced in Sri Lanka and is about 5.6 x 4 millimeters in size. Chrysoberyl is the gemstone that produces the most distinct "cat's-eye," or chatoyance. If a person uses the name "cat's-eye" without the name of another gemstone (for example, "cat's-eye tourmaline"), then he is most likely referring to chatoyant chrysoberyl. Cat's-eye chrysoberyl has also been called "cymophane." The phenomenon of cat's-eye occurs in cabochon-cut stones that contain a high density of parallel fibrous inclusions. The "cat's-eye" is a line of light that reflects from the dome of the cabochon at right angles to the parallel inclusions. The line of light is very similar to how a spool of silk thread will produce a line of reflection across the top of the spool as it is moved back and forth under a source of light. Some specimens of cat's-eye will appear to have a different color on each side of the cat's-eye line when illuminated from the proper direction with respect to the observer's eye. It gives the illusion that the stone is made of two different materials, a light material on one side of the line and a dark material on the other. This phenomenon is known as the "milk-and-honey" effect. 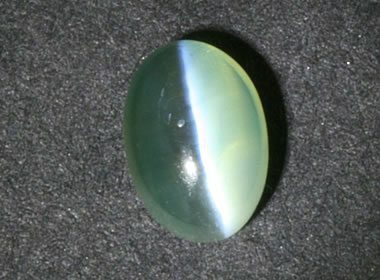 A photo of cat's-eye chrysoberyl showing the milk-and-honey effect is shown on this page. Alexandrite: A faceted specimen of color-change alexandrite of 26.75 carats from Tanzania, showing a blue-green color in daylight and a purple-red color under incandescent light. Photographed by David Weinberg for Alexandrite.net and published here under a GNU Free Document License. Alexandrite is the color-change variety of chrysoberyl. The most distinctive specimens appear to have a green to blue-green color in daylight but change to a red to purplish-red color under incandescent light. Specimens with strong and distinct color-change properties are rare, highly desirable, and sell at very high prices. Stones over five carats are especially rare. 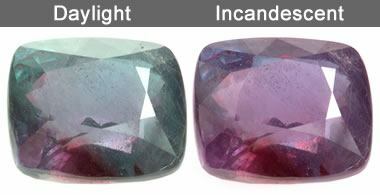 A photo pair of an alexandrite gem in daylight and incandescent light is shown on this page. The change in color is thought to occur only in specimens where chromium substitutes for aluminum in the mineral's atomic structure. The chrysoberyl in which this phenomenon was first observed was named "alexandrite" after Tsar Alexander II of Russia. Since then the "alexandrite effect" has been observed in other gems, which include color-change garnet, spinel, tourmaline, sapphire, and fluorite. Alexandrite is a rare material, only found in very small deposits. It was first discovered in the Ural Mountains of Russia in the late 1800s. Although that deposit has been mined out, small deposits have since been discovered in Brazil, India, Sri Lanka, Myanmar, China, Zimbabwe, Tanzania, Madagascar, Tasmania, and the United States. Alexandrite can also be strongly pleochroic (a stone that has a different apparent hue when viewed from different directions). It is a trichroic stone (exhibiting three different hues from three different directions) with a green, red, or yellow-orange hue depending upon the direction of observation. The pleochroism of chrysoberyl is not apparent in all specimens and varies under different types of light. It is not as distinctive as the color-change effect. Uses As a gemstone: chrysoberyl when transparent, "cat's-eye" when chatoyant, and "alexandrite" in specimens that exhibit color change. Most specimens of chrysoberyl are nearly colorless or fall into the brown to yellow to green color range. Red specimens are occasionally found. Chrysoberyl often occurs in tabular or prismatic crystals with distinct striations (see photo below). It also occurs in twinned crystals with distinct star and rosette shapes. These crystals usually persist well and retain their shape during stream transport because of the mineral's exceptional hardness. 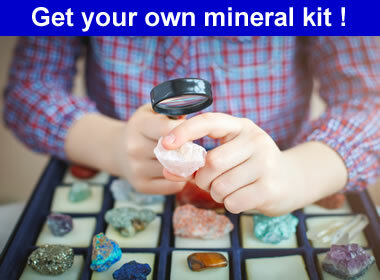 This makes them easy to identify in gem gravels, but the twinning often interferes with their usefulness as gems. Chrysoberyl crystal: A beautiful chrysoberyl twinned crystal from Minas Gerais, Brazil. Photo by Yaiba Sakaguchi, used here under public domain.